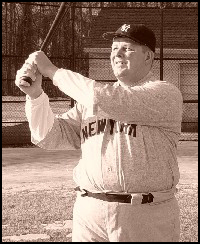 Ron Bolin is an Education Ambassador for the National Baseball Hall of Fame, appearing as Babe Ruth at a wide variety of events and for audiences of all ages. After many years of working in museum education in Connecticut, Ron decided to put his passion for baseball and museum education to work by developing an educational outreach program on the life of Babe Ruth. He has presented the program at the Baseball Hall of Fame and at numerous schools and community organizations throughout New England. Ron is the founder and Director of “Baseball History Alive”, a non-profit baseball education outreach group, which recently raised funds to place a memorial plaque on the site of a 19th century National League ball field in Hartford, Connecticut. A lifelong Chicago Cubs fan now living in Connecticut, Ron’s passion for baseball and talent as a storyteller will continue to work together to spread the goodwill of baseball and keep the spirit and legend of Babe Ruth alive. I have worked in museum education in Connecticut since 1999. I have a great love for American history as well as baseball history. Having presented countless living history/costumed portrayals over the years, I thought it would be great to tell the stories of baseball history in the same way, particularly that of Babe Ruth. I had met Linda Ruth Tosetti, one of Babe’s granddaughters, in 2003 and I approached her with the idea and she loved it. She was grateful that I was willing to work so hard to teach and preserve the legend of her grandfather. I approached the Baseball Hall of Fame and offered my program to them, they invited me to do an appearance there in March 2007 and after that day I became an Education Ambassador for the Hall of Fame and the official Babe Ruth. “Baseball History Alive” was formed in Jan. 2004 as a resource for my program information. My affiliation with the Hall of Fame has helped me to establish credibility and create opportunities to appear as the Babe and teach a new generation of children of his greatness. I think the Babe is the greatest ball player of all time, hands down. I am amazed that a kid out of a home for boys, without great physical size or knowledge of baseball beyond the sandlots, could rise to become the greatest ever. I feel he is still the home-run king both single season and of all time. Maris needed 50 more at-bats in 1961 and Aaron needed 3,000 more at-bats over his career to break the Babe’s marks. I don’t even count the steroid era as a serious challenge to any of his records. In his day, the world loved Babe Ruth and still does. The more I learn about him the more I admire him, he must have been a great guy. He is still an icon, maybe more-so now because he did not cheat to achieve greatness. But still, most people, especially kids, know very little about him. That is where my program “The Life & Legend of ‘Babe’ Ruth” comes in. I am also writing a childrens book to use in my classroom presentations, it is called ” I wasn’t alway the Great Bambino”, its an inspring story for kids about how he overcame a rough start and achieved greatness. He was always very generous and a favorite of kids and I try to keep that spirit alive by giving away baseballs to kids and t-shirts and even a bat and glove here and there during my programs. As an Education Ambassador for the Hall of Fame, my job is to spread the goodwill of baseball and life, as the Babe did. Quite often, but mostly in spirit and stature. The Babe had a classic face that is hard to duplicate, but like the Babe, I am 6’2″ and heavy-set. I do pay strict attention to my uniforms and equipment, everything must be a perfect period reproduction, no polyester jerseys or Nike shoes. The period reproduction uniforms and equipment are hard to find and expensive, but every detail must be correct to make my portrayal as authentic as possible. My next appearance will be at the final Hall of Fame game in Cooperstown on June 16th. I will be marching in the parade, greeting fans during the Home Run Derby and re-enacting “The 1932 Called Shot” on Doubleday Field during a break in the game with the Cubs and Padres. I hope my re-enactment makes it on ESPN. It should be quite a historic event for the Hall of Fame and a great time for fans. If I can bring the Babe alive for a brief moment and make a few people smile, then that’s what it’s all about. To learn more about Hall of Fame “Education Ambassador Series” click here. Add your thoughts or questions to the BRC Blog.